Aukey Desktop: 5-Port USB 2.0 hub with AC Adapter. AUKEY Entire Protect. Featuring smart AI Power Technology. 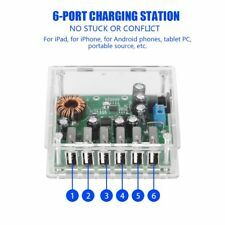 Ports: 5 x Hi-Speed USB AI Technology Ports. Power: 50W. Colour: Black. Designed to work with all popular USB powered devices from iPhones to Android phones, tablets, Bluetooth speakers and more. Bamboo Holder is compatible with all versions for Apple Watch and all for iPhone. 1 Bamboo Phone Holder. Material:Carbonized bamboo. Can hold your iPhone at a comfortable angle. Compact size and lightweight, easy to carry. 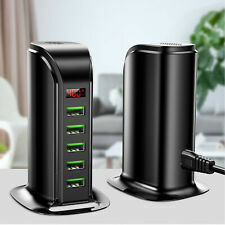 1 x 5-port USB charging station (base). Line Cable 1.5 m. Rated Maximum Total Output: DC 5V 6.0A. Quality is the first with best service. With a wide range, good quality, reasonable prices and stylish designs. Total power: 100W(Max). 1 x 20-Port USB Charging Station. USB output: DC 5V 18A(Each Port 2.4A Max). Compact size, lightweight and easy to carry, bring more convenience for you. Premium fire-resistant ABS housing and high-quality built-in smart chip ensure a long life. 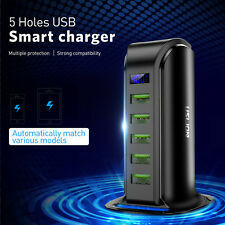 1 x 5-port USB Charging Station (base). Compatible with iPad, iPhone, Smartphones and Tablet. 【Safey Certificates】USB Charging Station CE / RoHS / FCC Certificates,Overheating and short circuit protection, Suitable for modern household and office use. Elegant appearance: Bamboo wood material make it looks cool and elegant! Easy to place and convenience to use. Luxury style: High grade wearable Bamboo, smooth texture, delicate and comfortable touch,It has an elegant appearance. Bedside, living room or even the kitchen table, anywhere you like to! A urgent sound are begging for a peaceful and clean space. Easy and Convenient With our 4-port USB charging station dock, keep your smartphones, tablets and other devices organized and fully-charged on your desktop. Easy to use, easy to clean. Specifications Material: ABS in Wood Grain finishing Color: Wood color Size:7.09INCH*4.49INCH*2.8INCH Input: 100-240V AC 50-60Hz Output: 5V DC4800MA (max) Cable Length: 5 feet Please note: USB charging cables are not included. Sell Charging Station Dock Organizer ONLY, phone/tablet/iwatch are not included. Package included: 1 x Charging Station Dock Organizer. Compatible with most devices with a bottom centre Micro USB port. With its small size and sleek, lightweight design, this Micro USB smart phone dock looks great in your office, kitchen, on a table or desk top. The unique design integrates the apple watch and phone in one single harmonious product to provide the best of utility. Its clean aesthetic coupled with a raised structure enables a clear view of both the iphone and watch display for any notifications that pop up during charging. USB Charging Station. Dub Station Ltd has 15 years of experience in the leisure industry. Gas & Water. We use a variety of carriers depending on the order and location. Multi USB Charging Station with 4 USB Ports, LED Nightlight & Phone Stand for iPhone, iPad, Tablets, Smartphones and Other USB Devices White. Floureon USB Charging Station with 4 USB Ports, LED Nightlight & Phone Stand for iPhone, iPad, Tablets, Smartphones and Other USB Devices. Health Care Shiatsu Kneading Neck Shoulder Back Waist Belly Massager Relax Heat. 10" Realistic Handmade Real Looking Newborn Baby Vinyl Silicone Reborn Doll Girl. Wireless Bluetooth Shower Speaker Waterproof Blue Car Bathroom Mic Suction Cup. 100-240 volt AC input compatibility, never need to worry about taking a bundle of adapters for international travel. - Material: Plastic surface. Local pick up is not available. - Color: Shown in the pictures.